Some loyal PSN users are finding a nice little thank you note in their inboxes this morning, along with $10 worth of PSN credit. Thank you for being a loyal customer and fan of the Playstation Network. 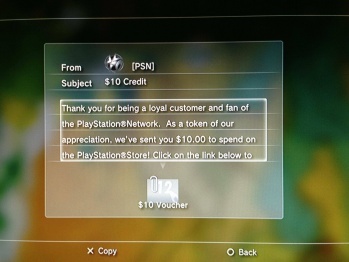 As a token of our appreciation, we've sent you $10.00 to spend in the Playstation Store! Click the link on below to redeem your credit. There are conflicting reports on just how "loyal" of a customer you have to be order to receive the gift, with some people who recently spent as little as ten dollars getting it while others who have spent hundreds of dollars not getting anything. The only criteria we know for sure is that you have to have spent some money recently in the Playstation Store. Sony has run campaigns like this in the past, where spending a certain amount of money would get you credit in the store, but those were usually advertised in advance. The fact that this gift came out of no-where suggests it was possibly done as a last-minute thing to generate hype. $10 is a decent amount of credit, and can actually buy you a full game such as Hotline: Miami or Castle Crashers. It's a nice gesture from Sony, and a far cry from Microsoft's infamous "20 free Microsoft Points" (~25 cents) birthday promotion.